Ryan Pitkin Robert (left) and Roger Kongham hope their restaurant will play a role in revitalizing the oft-forgotten lower level of Park Towne Village. Roger and Robert Kongkham are no strangers to Charlotte's Thai food scene. About 28 years ago, around the time Roger was born, their mother and former stepfather opened the first Thai Taste in Charlotte, and both have played an integral part in the restaurants as they've grown up. 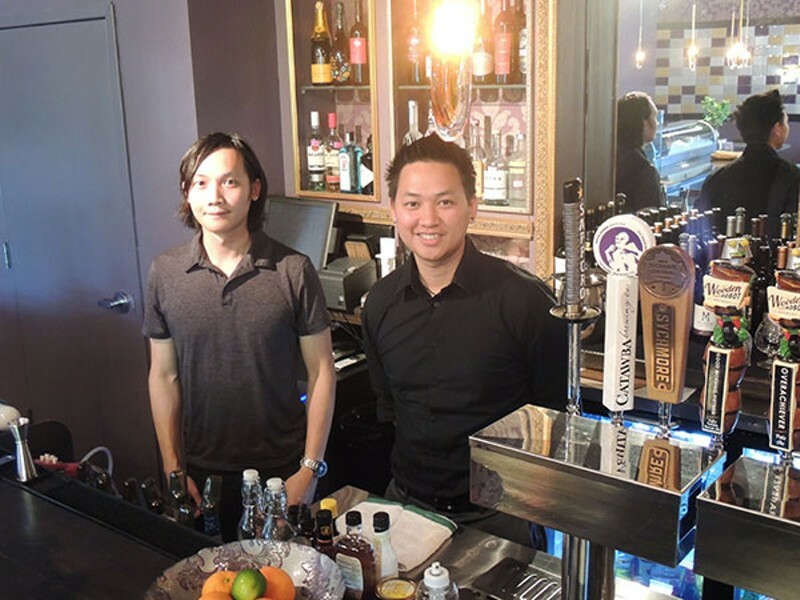 In June, the brothers officially flew the nest, opening their own Thai-fusion restaurant called Hibiscus in Park Towne Village in the Montford area. It's tucked away in the lower level of the Village, but Roger hopes that Hibiscus and Bonchon, opening soon right next door, will lead a revitalization of that oft-forgotten corner down the stairs. We caught up with Roger to talk about what made him and his brother decide to follow their own vision and how keeping things local is important to the sons of a small business owner. Creative Loafing: What made you and Robert decide to open Hibiscus? Roger Kongham: When we started managing the two newer Thai Taste locations, we wanted to make some changes but some of the partners weren't very receptive — people liked it the way it was. The other restaurants were a little bit more resistant to change because they've been around for so long. Why change anything that's not broken, right? Even though we are related to Thai Taste, we are not going to be Thai Taste. We were kind of anxious to have something of our own to be more of an expression of how we saw the restaurants going, something more of an expression of our generation. We wanted to do something more of an expression of ourselves. We traveled quite a bit and got inspiration from a lot of places up north: New York, Chicago, different kinds of bars and lounges that inspired the speakeasy atmosphere. Where else do you look for inspiration on how to make Hibiscus inviting for customers? I've been explaining to customers that we're open and receptive to any kind of changes they want to see — any kind of feedback or criticism that they want to give us. Because we are very open-minded. We know we're trying a new concept, especially in this area of Charlotte. Since I know that it's a new concept for us, we're trying to be receptive of people's tastes. Even though we've been in the restaurant business for a while, we're not trying to tell people what's good. We want to know their opinions and how we can adjust to better suit their tastes. We're just coming in there with an open mind and trying to be humble and receptive to any kind of changes they want to see. Honestly, we just really want to push out a good product that we're proud of and that people enjoy. You have local breweries here on tap, I've noticed. Is that something that's important to you? Besides the local breweries, we also used Modern Lighting on East Boulevard and ordered a lot of stuff through them. Even for the Live Edge table [a large table at the front of the restaurant}, the wood that we bought for that was locally sourced from North Carolina. As well as the people that we got to make it, instead of just ordering a Live Edge table on Amazon or something. Even the art on the walls is all by a local artist named Duy Huynh that my brother and his wife found. A few of the customers have recognized the artist's work, a few customers are actually friends with the artist. I know that a lot of people in North Carolina — especially Charlotte, it's a growing community — a lot of people agree that it's good to support other local businesses. We all stick together. If you can get a product from anywhere, I feel like you might as well go with something local. Support your neighbor, you know?